General search area: Upper Covington Flats at the 10.6 mile Serin tower radius, between the trailhead road and the large canyon to the southwest. It’s flat and it’s not Smith Water. Actually I needed a break from the Smith Water area to think about things and this seemed like a pleasant alternative. As far as I know it’s never been searched, by air or on the ground. I haven’t any ideas for a scenario that could put Bill there, and there is no direct Serin coverage, but it’s at 10.6 miles. And it’s not Smith Water. 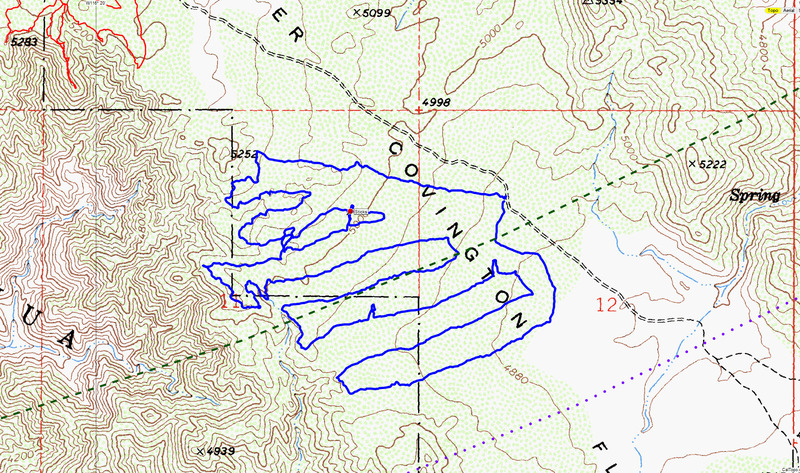 The area covered was generally between the dirt access road to the Upper Covington Flats trailhead and a very large canyon to the west. Northerly of the area the terrain is quite open due to an earlier burn and seems unlikely to have any hiding places. The area searched is a forest of junipers, many possibly providing cover. As mentioned, there’s a very large and deep canyon to the west. At the edge of this canyon, the Palm Springs and Palm Desert area is plainly visible, and a cell phone in this vicinity could ping a great many cell towers. 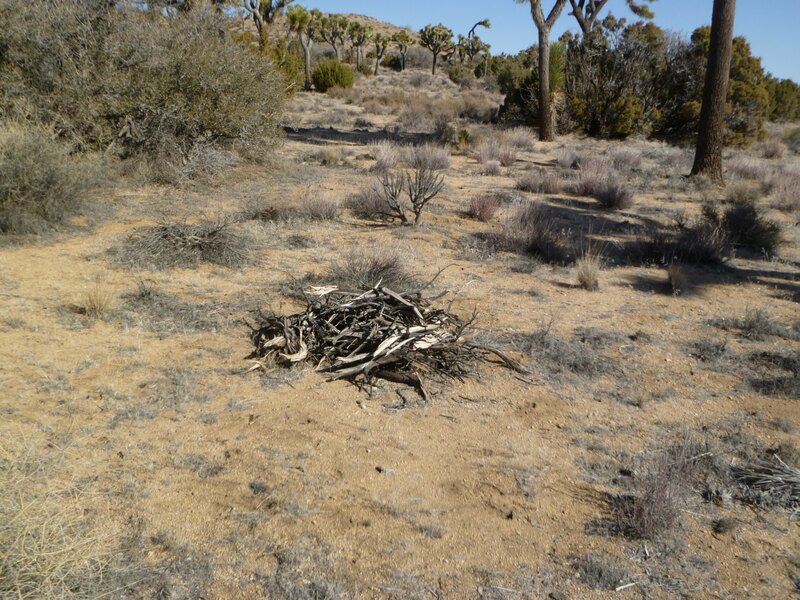 There was no evidence of recent human activity, and I’d speculate this area gets little visitation. I did come across something odd, a pile of sticks. It was not a natural deposit, and had plainly been collected and stacked. Yet I could find no evidence of any campsite or other ground disturbance. There were a number of very large junipers nearby, capable of providing good shelter. I carefully checked beneath them all but could find nothing non-natural. I am at a loss to explain what the sticks were for. 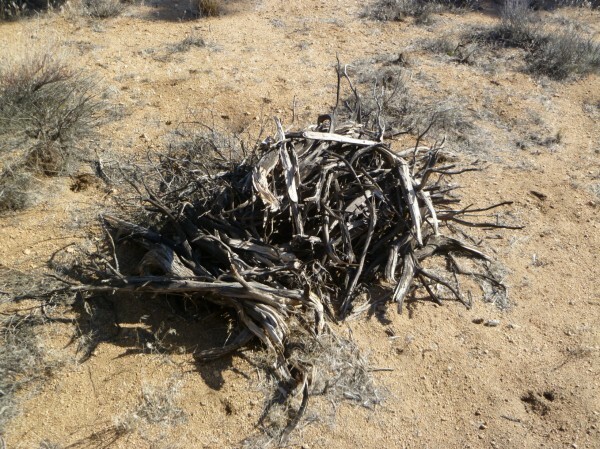 I will concede it’s a sad commentary on the state of things when the most interesting item I have to report is a pile of stinkin’ sticks. I’d estimate my coverage to be 80% within 75 feet of my travel path at a minimum, and in some areas a much wider swath. I focused on the area slightly nearer the Serin cell tower than the 10.6 mile radius. My thinking here was that since there was no direct line of sight to the Serin tower, if there was a connection from this area it would have had to have been via a reflection. If that’s the case, the true distance to the Serin tower would have been less than 10.6 miles, with the additional length of a reflection increasing it to 10.6 miles. 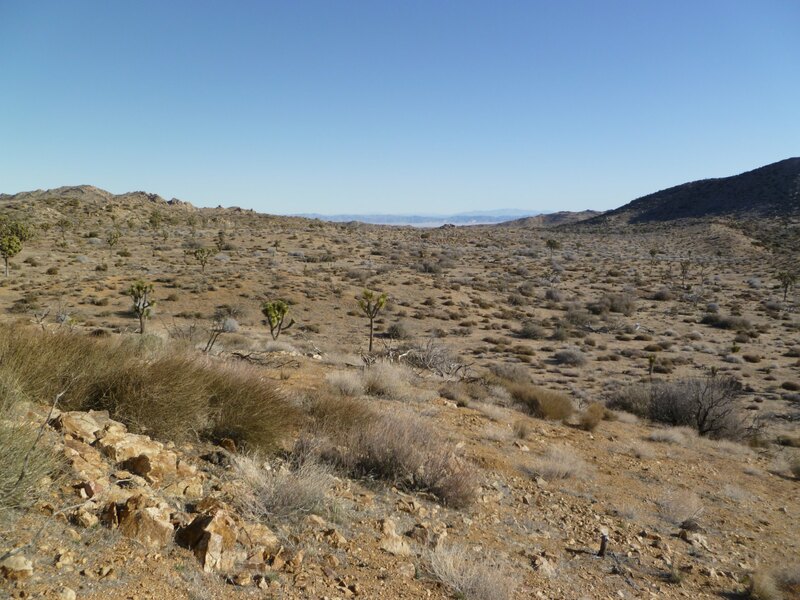 In my wanderings through obscure areas of Joshua Tree National Park, I have been repeatedly surprised by the amount of human footprints I’ve found in places I wouldn’t expect people to be hiking. This tells me the backcountry gets a respectable amount of visitation. Yet in 2 1/2 years, a hiker has yet to come across Bill. This suggests to me he’s in an area where no one really goes. Bill had almost three days of possible travel before the search really kicked into high gear, yet in all that time he apparently hit neither any of the roads bounding the area or the trails. And on Sunday morning he was presumably 10.6 miles from the Serin cell tower. The only locale these facts can combine to make any sense remains the Smith Water Canyon area. Now this displeases me to no end because I’ve really grown to dislike the lousy place. But after all the places I’ve been in the area, it’s the one spot where I think someone could get stuck and not be found. So unless I can come up with anything better, I still think the Smith Water Canyon area remains the area of highest probability, perhaps in a spot not obviously visible. The JT48 search tracks in blue with earlier search tracks in red. The pile of sticks is marked in the upper center of the tracks. The 10.6 mile Serin tower radius is the green dashed line and the 11.1 mile radius the purple dotted line. Looking northerly from the JT48 search area showing the open burned area. The Upper Covington access road is barely visible passing through the upper center of the picture. 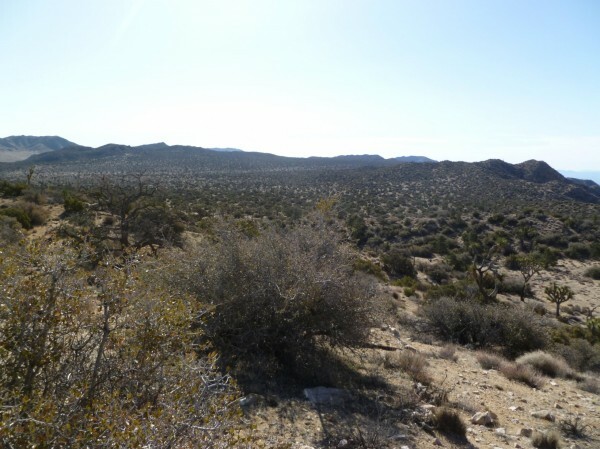 Looking southerly into Upper Covington Flat showing the typical juniper coverage. At the left edge of the picture is the drop off to the Coachella Valley. Looking westerly from the edge of the search area. 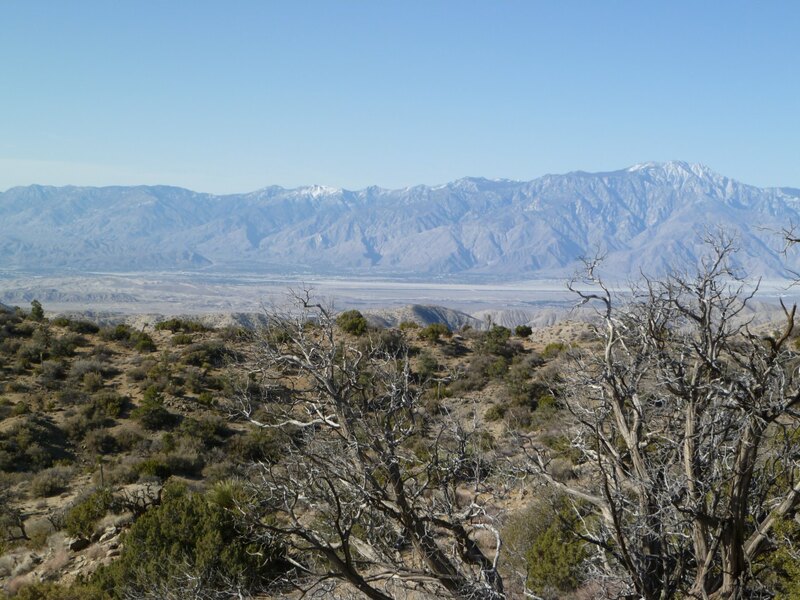 Palm Springs is clearly visible to the lower left of San Jacinto Peak. Excellent cell coverage near the westerly edge of the search area. The pile of sticks in context. A closer look at the pile of sticks. They were collected and placed upon a small bush. This isn’t the remains of a dead shrub that grew at this spot. There was nothing found inside the pile.